[German]Good news for users of HP and Samsung All-in-one printers. A bug in the Easy Document Creator software that prevents scanning under Windows 10 V1803 has now been fixed with an update. In early May 2018 Microsoft started the rollout of Windows 10 version 1803 (April update). As a result, users of HP and Samsung All-in-one printers made the unpleasant experience, that the scan function was no longer available. Under Windows 10 version 1803 it was no longer possible to scan using Easy Document Creator. 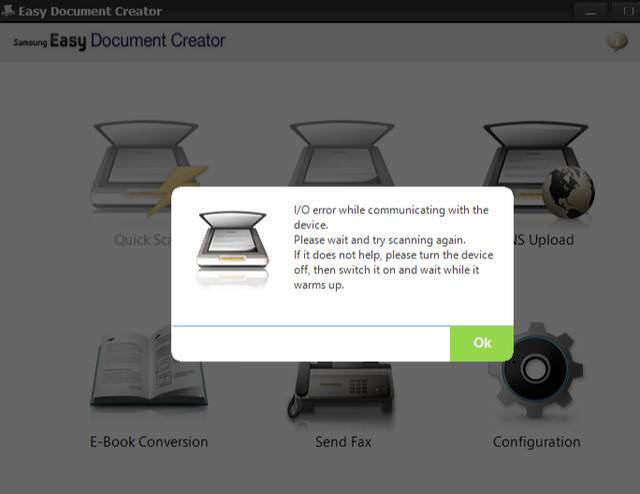 Messages such as ‘The current process has failed’ appeared in “Scan to PC”. Or an error message as shown below has been displayed. I had addressed this issue within my blog post Windows 10: Scanner fails after update. Within this blog post I mentioned the workaround using the software NAPS2 (Not Another PDF Scanner 2) to continue with scanning. Then some readers informed me, that HP / Samsung released a hotfix for the I/O error in their All-in-on printers. I’ve reported more details within my blog post Windows 10 V1803: Hotfix for Easy Document Creator Scan. A comment from a German blog reader (thanks) informed me, that HP/Samsung has updated the Easy Dokument Creator. 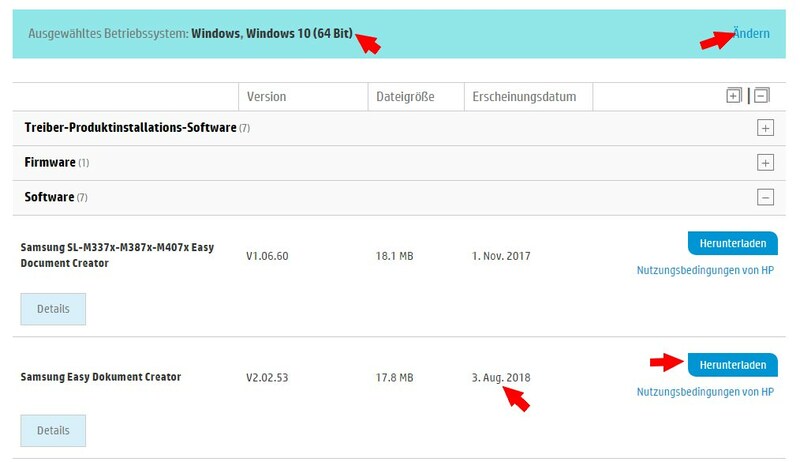 They offers a new version V2.02.53 dated August 3, 2018, which works with Windows 10 V1803. Go to HP’s support site for Samsung Poxpress SL M3875 Laser-Multifunktionsdrucker (it’s a German web site, or navigate to any other HP All-in-one printer support page). Select Windows 10 as operating system withint the page header. Then search under ‘Software’ for an Easy Document Creator version V2.02.53 download dated August 3, 2018. Then install the 17.8 MB file WIN_EDC_V2.02.53.exe and test, whether the scan feature in Easy Document Creator is back to operation now. This entry was posted in issue, Windows and tagged issue, Windows 10 V1803. Bookmark the permalink. Thanks for publishing this fix!! !